Adjustable 2-piece set fits odd shaped items from 48'' to 90'' in length. Our adjustable telescoping boxes are designed to provide the perfect packing and storing solution for odd shaped items. The 2 piece set includes an inner and an outer carton (sold separately). 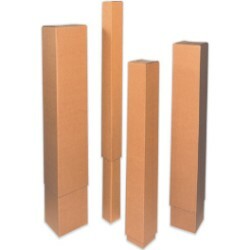 Made using high quality kraft corrugated 200 #/ECT-32, each box is sturdy and durable. These telescoping boxes are made even sturdier by the full over lap (FOL) bottom that is capable of accommodating even heavy items. Telescoping boxes prove to be an ideal solution for organizing, packing and storing large as well as small parts like gifts, tapes, pins, tools, drills, milling cutters, reamers and much more. Their adjustable nature makes them ideal for use in every kind of business as well as for use as gift boxes. Our telescoping boxes are used extensively by pharmacies, hospitals, electronic firms, factories, warehouses, dealers and by anyone who wants to solve storage issues with high quality, durable, sturdy and easy to store boxes.